The meeting next week between the heads of the Russian Orthodox and the Catholic Church is the first real move to breach the gap between the two which could have been motivated by ISIS’ genocide of Christians in Syria, says Ben Ryan from the Theos think tank. 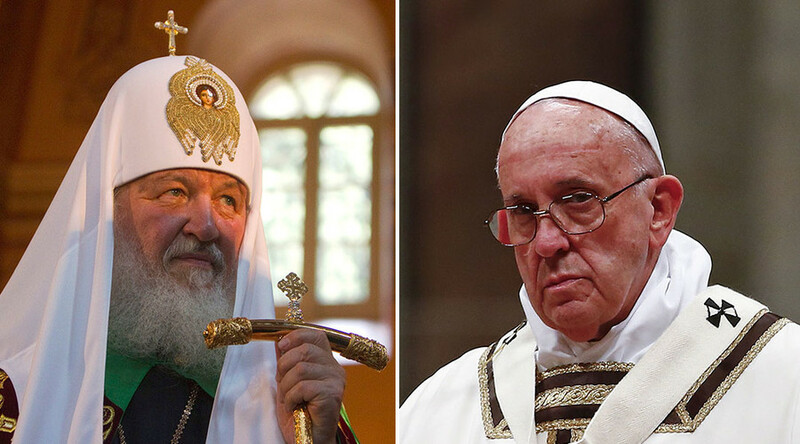 Pope Francis will hold the historic meeting with Russian Orthodox Patriarch Kirill in Cuba. It's the first meeting of its kind since Western and Eastern Christianity split in the 11th century which became known as The Great Schism. RT: What do you think about the significance of the meeting between the Russian Orthodox Patriarch, Kirill and Pope Francis? Ben Ryan: It is absolutely huge. This is the first time there has been any real meeting, and meeting of any sort, between the Pope and the Patriarch since the split. There have been moves by the Catholic Church to meet with other Orthodox churches. It has been a theme of the Pope Francis ministry that he has been reaching out to the other Christian groups. This is the first time we’ve seen any real move to breach the gap between the Eastern Orthodox Church in Moscow and Rome. RT: The Russian Orthodox Patriarch was at the same place as Pope Francis…Who would have initiated this? BR: I am not sure. It is absolutely fascinating whether or not it is a coincidence. It is an amazing place to meet. This symbolism of meeting in the place which of course has been so synonymous of conflict between West and East, Russia, the Soviet Union, and the West as Cuba. Which also has its history as a very important place in Latin American Christianity - it was the first place that Christopher Columbus landed. It is obviously significant symbolism. If it is worked up by chance, that’s fantastic as you couldn’t have worked it any better if you have been initiating it with the full team of advisors. RT: For the people who are not so familiar with the significance of this event tell us about relations between the two Churches? BR: It has not been terrible, but there certainly has been very little communication…The Catholic Church has remained extremely powerful in Western Europe, the Eastern Church remained very powerful throughout the entire period of the Tsars. But then of course it was persecuted under the communist regime, and is now back into a position of some serious political prominence under Putin. There hasn’t been a lot of effort from them to breach the gap, partly because they have not been interfering with each other very much directly in the way that Protestant and Catholic Churches, for example, have been. But nonetheless there has been an area of growing concern that these Churches aren’t talking together particularly when an issue like the Christians in the Middle East – is so very critical to both of them. RT: Will the slaughter of the Christians in Syria bring these two Churches together to try and act as one? BR: Yes, I think it has to be seen as the motivator. It is absolutely astonishing and genocide probably is the correct term, the absolute elimination of the Christian presence, and these ancient churches in the Middle East. That is absolutely appalling. And it is something which the West generally has been very slow to speak on, something which Putin interestingly has been quite keen to speak on; he has been taking a move in leading on that among world leaders. And also interesting therefore that perhaps this is an effort by Pope Francis … to fire a warning shot to some of the West’s political leaders that actually their response has not been good enough… They need to have some encouragement.